Another event to plan as part of your wedding? 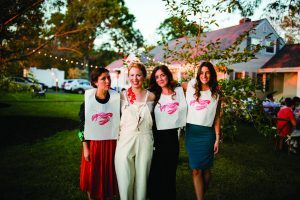 You’re either grinning or groaning, but either way, the rehearsal dinner will be one of the easiest parts to pull off thanks to your friends here at Newport Wedding Magazine. Typically, immediate family and their spouses and children along with the wedding party and their dates and children are invited. Depending on the scenario, couples may invite out-of-town guests to join, or instead have an “after party” to include them. Hotel Viking, OceanCliff, Gurney’s Resort & Marina, and the Atlantic Resort all offer room block accommodations specifically for weddings, and they each have bars to boot. Another detail that might leave you pondering is whether or not they all come to the actual wedding rehearsal. After all, shouldn’t it be a surprise for the big day? Well, you’re right, only those in the wedding party and immediate family should attend that, but the dinner is entirely up to the betrothed. How formal should it be? The only real rule here is that the rehearsal dinner shouldn’t outdo the wedding itself. Keeping it on the casual end of the spectrum will give your families an opportunity to kick back and get to know each other better, or at least relax in the midst of the chaos and nerves! 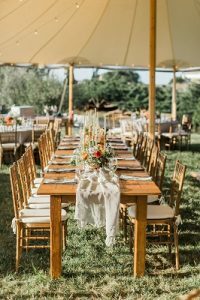 Consider hosting the dinner outdoors, weather permitting, like a picnic style at Sweet Berry Farm or at Brenton Point State Park to keep things casual. There’s no law against holding it in a backyard, either! After all, the real celebration is still to come. Restaurants are a -plenty in Newport County. If you want something to contrast a formal wedding, set your eyes on Broadway, with restaurants like Salvation Cafe or Caleb & Broad. Newport is also home to Sardella’s, who has been voted the Best Rehearsal Dinner Spot by Newport Wedding Magazine for many years. Or hop over the bridge into Jamestown for Simpatico, a romantic yet fun spot perfect for large parties. 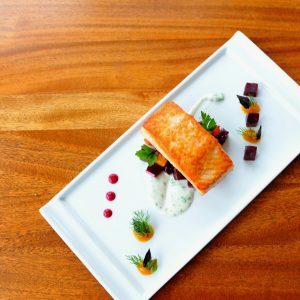 Tiverton’s Boathouse is accustomed to frequent events like rehearsal dinners, too, if you’re hoping to keep the entire weekend upscale. You might consider relating the venues for a fun twist. 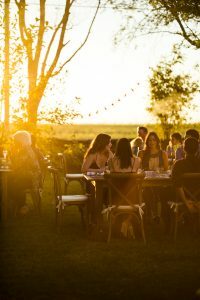 For example, if you’re a wine aficionado hosting your wedding at Newport Vineyards, have your rehearsal dinner at Fluke Wine Bar and tie together your entire weekend in a cohesive way. Most venues will have suggestions for what to serve, but if you do it on your own you might try a buffet style or even family style with dishes that represent the area or your family. Salmon at Boathouse, Tiverton. Photo by Dave Hansen. If we’re talking tradition here, the groom’s parents typically plan and pay for the rehearsal dinner. Now that its 2018, this isn’t quite as rigid. Many couples pay their way, or their parents split the cost. Really, this comes down to each family’s personal choices. This could be the time to do a presentation for a small group that might not be possible on the actual wedding day. Many times, the wedding party will play a memorable slideshow or family members will make a toast that serves well in a more intimate setting. Don’t forget your attire! 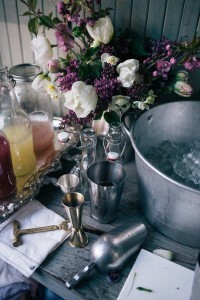 This all depends on where you ultimately decide on for your venue, but typically it’s a “casual” event. Ladies will usually be in cocktail dresses and gentlemen may be wearing a button down with khakis, of course if you’re outdoors or at the beach there may be an exception. Whatever you’ll be comfortable in depending on the weather and location is perfect, don’t feel like you need to compete with your wedding day look! Next Story → You’re Engaged! Now What?